A Group/Headcount Meeting in which this person was neither marked present or absent. Member was not marked present and attended elsewhere. Member was not marked present and was Off-Site. Member attended elsewhere as a Volunteer (VIP Member Type). For better visibility, in some places the dot (.) is displayed as a dash (-). Go to the person’s record Involvement > Current tab. Click on their Member Type for the organization you want to see. You can also go to the organization and click the Member Type for any current Member. The attendance string will display 52 items. For organizations that have more than one meeting per week, the string will display approximately 6 months worth of attendance. For an organization with Schedules that have an attend credit of “One Per Week”, there will be only one position on the string for each week. The most recent attendance will be on the right of the string. In the sample report above the P on the far right is the most recent meeting and the G on the left is 52 meetings ago or when her attendance started. This report has 2 tabs - Attendance History and Transaction History. 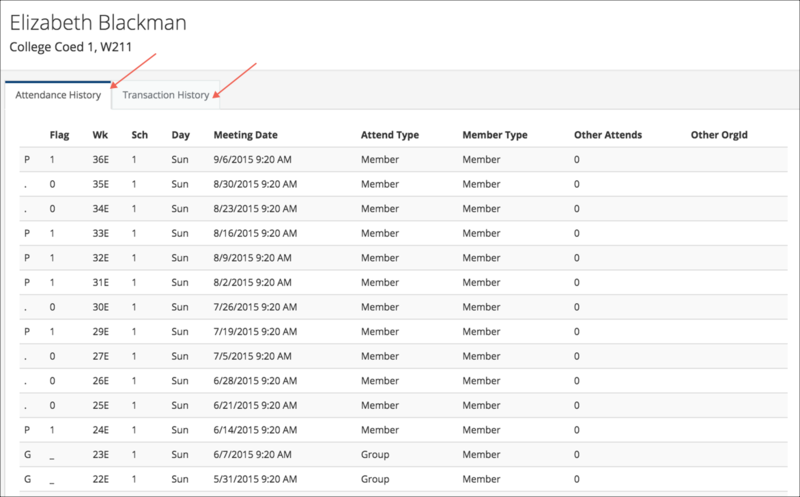 The Attendance History lists all the possible meetings for the org, and identifies the meeting(s) the person attended. The Transaction History lists the transactions associated the person’s enrollment history. 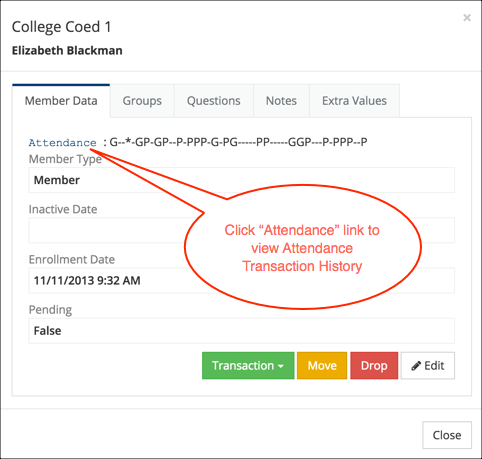 Click the Attendance link beside the Attendance String then select the appropriate tab.